Veneers from Orgreave Dental Surgery in Sheffield are used when your teeth need sprucing up – we will consider and discuss various options to get your teeth looking as nice as possible. Depending on the condition, position and colour of your tooth or teeth, you may be able improve their position with orthodontics, place tooth coloured fillings, crowns or veneers. Veneers are suitable where your underlying tooth is a reasonable colour match, in almost the ideal position, do not have fillings already placed in a couple of crucial areas, and do not have excessive biting forces on the tooth – so not all that many teeth are best served by veneers! Veneers are a thin, ceramic facing that is cemented onto the front face of a tooth – they are individually constructed and ‘characterised’ – the process of adding in that natural variation that makes teeth look like they should – those small coloured areas that are easy to miss unless you examine a tooth carefully. 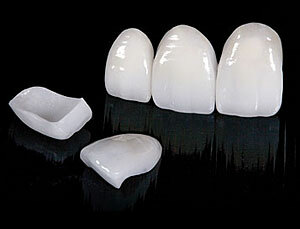 Depending on your preferences, we can have these made to look very natural, so that it is hard to tell that they are not natural tooth, to the very bright and white ‘Hollywood’ Smile. Our preferences are towards the more natural style! With nuances on the shape, length and gum position, we can further emphasise this individualisation, so work with us to create the look you desire!